For those of us who were until recently more sympathetic to Antarsya, the “other” left-wing coalition on Greece’s radical left, it is salutary to reflect on how well Syriza has done in the last month, and how poorly Antarsya has done by comparison. 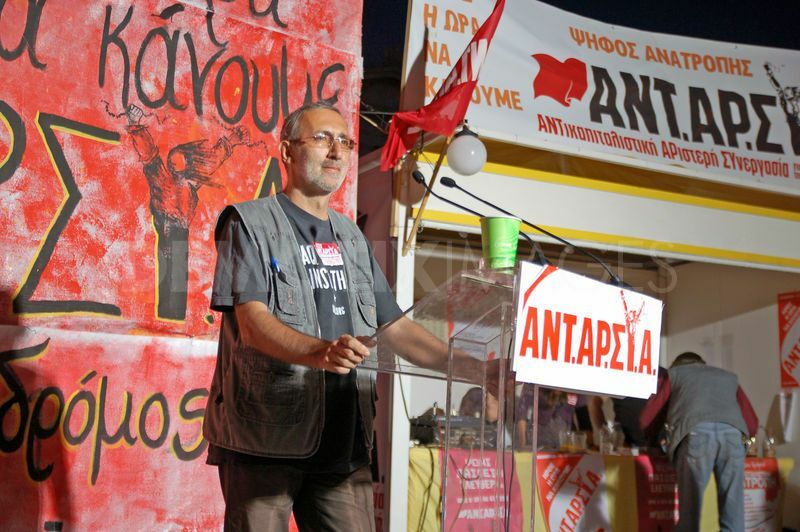 The justification for Antarsya’s separate existence goes something like the following: Antarsya, unlike Syriza, is a coalition of the parties that believe that Greece can only be saved by a revolutionary transformation of the state. Syriza, unlike Antarsya, equivocates on this issue, and on the connected questions of whether the Greek government should remain in Europe or whether it should agree to pay any of the debt to its international creditors. Those who vote for Antarsya are voting for a revolutionary alternative to capitalism and, in so doing, they keep alive the possibility of a revolutionary politics. Syriza by contrast is merely reformist; and likely to every bit as shabby in government as PASOK, Labour etc. Inevitably in the last election, Antarsya’s vote was squeezed to just 0.6% since the election became a referendum on the possibility of a left-wing government (which most politicised workers want), but by standing Antarsya has kept pressure on Syriza from the left. Its stance outside Syriza has all the benefits of being associated with a rising movement (the sales of Workers’ Solidarity the newspaper of one of Antarsya’s affiliates, have apparently never been so high), but none of the disadvantages of being associated with Syriza’s defeat, when that disappointment inevitably comes. Where this justification of Antarsya begins to fall down is with the assumption that the best alternative to a programme of reform is to offer a rival, programme of greater reforms. In this revolutionaries are different from reformists principally in that they ask for more. So Syriza offered Greek nationality to the children of all migrants; and, like a poker player, Antarsya “raised” them, by offering to legalise all immigrants in Greece. Syriza said that it would stop all the planned privatisations; Antarsya’s reply was to say that it would undo every privatisation in Greek history. Using elections to make revolutionaries is not about out-bidding your rival, it involves an explanation of both any government under capitalism has only limited power, and how those limits can be overcome (only through a direct conflict with the international capitalist class). It is at this point that Syriza comes over as politically more sophisticated than Antarsya, because it had an analysis of its own limits as a reforming government (the European powers will not allow us to write off more than a small portion of our debt), and an idea of how to get beyond that limit (on the basis of agitation from outside parliament keeping pressure on the government, and on the basis of support from the left outside Greece). In so far as they have a political strategy to deal with the problem of Syriza, Antarysa’s most articulate supporters are hoarding every example of Syriza’s betrayals, and counterposing to them the potential virtues of protest. The openings for a left-wing government in Greece are said to operate solely in relationship to the success of social movements. The reason why the Greeks have Syriza, it follows, while we are lumbered with TUSC, is that we only had the public sector pension battle while they have had 32 general strikes. But where is the mass movement supposed to come from, which will rise in such a direct and continuous fashion that it will be powerful enough to overcome the state? Syriza’s fault is said to be that it, like other reformist governments is continually conspiring to demobilise the mass movements by telling the workers to vote when they should be protesting. Yet all of us who are watching Greece can see for ourselves that – admittedly only in its first two weeks, and so far during a honeymoon period – Syriza has not been demobilising the movements, rather it has opened new possibilities for them to emerge: by taking down the barriers outside Parliament, with the demonstrations in support of its attempts to renegotiate the debt, and by the propaganda of sending its ministers around Europe and demanding that the debt be renegotiated. It comes over as the equivalent in the parliamentary sphere of the trade union official you always wanted to have, the one who actually enjoyed a fight with the bosses, and did not back down at the first sign of trouble. People respond to a fighter: so far, the Syriza government is giving further confidence to the social movements. Subject to the iron law that the global capitalist class has not simply renounced its hegemony in the face of a localised threat, neither will it, and therefore the big battles all lie ahead – Antarsya’s global supporters were wrong, and Syriza’s international admirers were right to challenge them, when the former predicted that Syriza would respond to power only by becoming increasingly moderate. The final assumption that underpins Antarsya’s supporters is that the working class is Greece has an infinite set of opportunities and that if it should miss this one, that would not matter, since at another stage in the future another party would doubtless emerge on the left, which would be based on different people from different traditions, and would therefore be well placed to carry on the previously-missing revolutionary war against the state. Should Syriza fail, it will not be simply politics as usual. The police and Golden Dawn will be jubilant, and their revenge on the movements will be no more tolerant than the counter-revolution now at work in Egypt. Before we all hail Dave as a revolutionary strategic genius who despite being based in Britain actually knows far better about what the Greek revolutionary Left should do than those Marxists with decades of experience in the Greek working class movement, it might be worth noting a few slight problems with his analysis here. 1) My understanding is that Antarsya’s vote actually doubled, from 0.3% of the vote to 0.6% of the vote, despite the pressure to vote Syriza this time around. Still tiny of course, but a positive sign of growing influence surely? 2) Just because some in Syriza have a strategic understanding of the limitations of left reformism, doesn’t mean that the associated problems with a strategy orientated towards winning office in the capitalist state suddenly are somehow dispelled. The fact that Syriza didn’t need to form a coalition with the Independent Greeks but did so anyway despite the fact that this is a racist right wing party shows some of the problems here. Imagine if the Green Party won the highest vote in Britain but formed a coalition with UKIP – wouldn’t we criticise this decision? The absence of any comment or criticism from Dave here is surely a bit problematic – especially given the need to fight racism and fascism in Greece. 3) Syriza may have removed barriers outside parliament and called demonstrations – but they have demobilised the class struggle because of their prioritisation of electoralism – blocking a teachers strike in May 2013 for example. Are they calling for more strikes now they are in power by way of building up pressure from below that can counter the pressure they are under from the capitalist class at the moment? No – they are not. Isn’t that a problem? 4) Syriza’s strategy of renegotiating the debt rather than calling for debt cancellation is a compromise that will mean they will inevitably end up trying to impose ‘nicer’ cuts on the Greek workers and poor – when these attacks come, what is the role of socialists – to be silent or to argue for strikes and protests to resist them? This is not a question socialists can just abstain on. 5) Attacking Antarsya when the stakes are so high in Greece seems to be a slightly sectarian move – Antarsya themselves support and will support Syriza when they make positive reforms – but need to preserve their political independence from Syriza so they can be in a position to defend workers and other oppressed groups when Syriza try to implement some austerity measures and cuts – which they will inevitably have to do now because of the strategy of trying to renegotiate the debt. 6) After only two weeks it is too early to say that Antarsya are wrong in the manner you have done – the only way Syriza will be in a position to avoid imposing cuts etc is if the pressure from below on them makes this impossible for them to do so. The task is therefore to build pressure from below – the strikes and the class struggle – on the Syriza government to balance the pressure they are under from international capital. Activists in Antarsya are better positioned to do this than those who are uncritically cheerleading Syriza it seems to me. 7) The key task for socialists in Britain is to call for the scrapping of the Greek debt but also building strikes and a left alternative to Labour here – you can stand aside and criticise TUSC from the sidelines – that is easy – but the Greek working class and international working class movement will be better served by the emergence of a credible left alternative to Labour in Britain. Socialists standing for TUSC (and other formations like Left Unity) deserve the support of socialists in May and in the run up to May. There are more options available to the left in Greece than opposition to Syriza or unconditional support. If you want the IS tradition to have a future, keep an eye on Antonis Davanellos; his views are going to have a rather greater impact in the next 12 months than those of Panos Garganos. Good luck with increasing TUSC’s vote. But even if TUSC was to double its vote in this election, and the next, and the one after, it’s years away from making an impact noticeable outside the ranks of the two parties that keep it alive. TUSC won 20,000 votes in the 2010 election, out of 30,000,000 votes cast. I’m sorry, but the need for solidarity is a bit more urgent than that. I’ll be on next week’s demonstrations, why don’t you join us? Christian insists on humility and on taking a lead from Greek Marxists with decades of blah blah blah. But his argument, far from reflecting either humility or concentrated experience, is exactly what one would expect from an obtuse, parochial leftist who gets all of his information and arguments from reading Socialist Worker. First of all, let’s take the teachers’ dispute of 2013, which Christian refers to. He uses a particularly slanted account of the failed mobilisation to justify his claim that Syriza has demobilised the social and industrial struggles in order to prioritise elections. Even if he was correct about that instance, it would not begin to justify the claim that Syriza is responsible for the demobilisation which began after New Democracy’s electoral victory in 2012. The mobilisations had begun in the first place independently of party initiatives, and Syriza with its relatively weak roots in the labour movement would not have been able to shut that down. On the other hand, in those cases where Syriza did have strength, it took the lead. Its role in cleaning workers struggles or in the struggle over the Skouries goldmine is significant. But he is also tendentious in the example he cites. This story, with all its important details shorn, has become a bit of an atrocity tale to justify the sectarian stance of head-in-sand leftists: Syriza “blocked” the strike for electoral purposes etc etc. The teachers dispute in May 2013 was initiated by the OLME, a federation of local unions representing secondary teachers, in the first instance because of severe government cuts. The OLME leadership voted to strike during the exam period. Syriza, representing a minority on the leadership, voted with the majority in favour of the strike. Tsipras championed the teachers’ demands, and called on students to show solidarity with their teachers, incurring media ‘controversy’ as a result. But the support for the strike was already weak from the beginning. The New Democracy-aligned DAKE union fraction, of which OLME chairman Nikos Papahristos was a member, began to backtrack from the start. Meanwhile the PAME, aligned to the KLE, denounced the idea of striking during the exam period from the very beginning. It is difficult to tell whether striking during the exam period would have generated requisite support by itself. These are judgment calls, inevitably. However, what can be said is that the government preempted their decision by issuing a civil mobilisation order, an authoritarian measure used repeatedly against militant strikes, which threatened to treat all striking teachers as essentially deserting soldiers who could be rounded up by the armed forces of the state and locked up for years. They could also lose their jobs. And it is clear from the reports that a very large number of members took this insult as a key reason to vote for the strike. However, to win against a civil mobilisation order, the strike would have had to build solidarity. This was the responsibility of the OLME leadership, of course, and they duly approached the two major teaching unions, ADEDY and GSEE – only to be rebuffed. The OLME leadership was weakening already, as Papahristos made it clear that OLME mainly wanted the civil mobilisation order dropped and for the government to go back into negotiations with the union. Even in this limited demand, he could only get the support of Syriza in parliament. The teachers were isolated by other unions, politically weak and threatened with the full armed force of the state. The majority in the union leadership, including the Syriza-aligned Aftonomi Paremvasi, began to row back from the strike. Paremvasi argued that most teachers had voted to strike mainly because they were pissed off with Samaras imposing the civil mobilisation order, and that those determined enough to strike and risk being flung into jail or immediately losing their jobs were a minority. Ultimately, the vote to abandon the strike was taken by the executive board, with 18 voting to proceed with the strike, 9 voting against, and 57 leaving their votes blank. A few things follow from this thumbnail sketch, which is roughly what anyone can find out from reading the Greek press and blogs. The first is that even if you think Paremvasi were wrong in their judgment call about the conditions for a strike, it is clear that they could not alone have prevented a strike from taking place if there was support for it. The second is that, again assuming that Paremvasi were wrong in their judgement call, there is no evidence that they acted for ‘electoral’ reasons. Indeed, Syriza members in the union were at the centre, alongside Antarsya and other comrades, of trying to restart the teachers’ dispute later that year. The idea that they downplay social struggles in order to prioritise ‘electoralism’ is totally unsupported by the evidence of their actual behaviour. The third is that you could criticise Syriza for many things. You could argue that it had a responsibility to take up the task of building a political mobilisation, using its links with other struggles to broaden the OLME dispute and break out of its isolation. You could argue that their decision to back off the strike was unnecessary and reflected a mis-reading of the balance of forces. You could argue that the Syriza leadership ought to have called big national protests to support the strike. All of these could be rationally grounded criticisms. Yet it should also be quite possible to discuss the strategies of Syriza in an open and critical way without reducing the issues to stark morality fables about the dangers of ‘electoralism’ etc. That is only useful to hidebound hacks. There is much more I could say, but the main point is this. Christian demands ‘humility’ and deference to experience. Criticism of Antarsya is sectarian, while criticism of TUSC takes place ‘from the sidelines’ (because TUSC is very forcibly and vigorously dominating the main arena). Yet he knows very well that the SWP, of which he is still a member and whose line he is faithfully articulating, has never declined to hold an opinion about situations abroad. This has been true, even where the party leadership and intellectuals pronouncing on these matters knew very little about them. And his comments in this thread are true to type. So he is in no position to scowl at others for expressing an opinion that is critical of Antarsya. Reading about the blocked teachers strike in Greece in May 2013 reminded me on a much smaller scale a little of the recent lack of action over pensions in the UCU union in Britain – a union leadership that is nominally ‘independent’ but in practice tied to the Labour Party (who do not want any strike action in the run up to the election as it will embarrass Ed Miliband) and so do not want to give a fighting lead to lecturers who are seeing huge attacks on their pensions. After getting a huge vote for action the UCU leadership used this not to lead strike action and a marking boycott but to get a shoddy deal with management – and then put this deal to the membership without any kind of lead on how to vote – and surprise surprise most members voted to accept the shoddy deal because of the lack of a lead. So even though the Greece teachers and the British lecturers are on one level very different kinds of struggles – on the other hand the fundamental similarity relating to questions of trade union leadership and political trade unionism come to the fore – and in both cases union leaders tied to Syriza in Greece and the Labour Party in Britain showed in these examples scant respect for union democracy and a fundamental lack of confidence in the power of industrial action. Perhaps Syriza can’t be blamed totally for the lack of class struggle since – just as Labour and Ed Miliband can’t be blamed totally for the lack of class struggle in Britain in recent years – but as Trotsky wrote when analysing the defeated British general strike of 1926 – there was a political thread none the less that connected the Labour Party leadership to the trade union bureaucracy – and then to the left trade union leaders and downwards. So while Syriza and Labour can’t totally be blamed for the lack of class struggle in Greece and Britain in recent years – neither can be let completely off the hook either. Arguing that a person outside Greece cannot comment on it is poor, particularly in light of the large ammount of excellent journalism and serious writing there has been on the Greek political system: you rather seem to be saying “keep your nose out”, which is not a strong argument. There is plenty of material upon which to make judgements. Perhaps you should try doing your own research, and not limiting your reading to whatever the Greek Socialist Workers’ Party says – you may learn something. Personally I think you are wrong, by the way, to say that we should condemn the coalition with Independant Greeks (ANEL). They needed to prove they meant business in standing up to the Troika, working with ANEL does that, and so far Syriza have forced ANEL to accept anti-racist reforms, so its hardly their biggest weakness. As for strikes, its only worth the unions taking action if there is actually anything to be won – and I really don’t think you are any smarter than me on what the tactical industrial situation is, whatever discussions between the Central Committees of two very small organisations (one still shrinking, I believe) lead you to think. I believe the best way for socialists outside Greece to have a positive impact on the situation is to recognise the radical potential of a Greek defeat of austerity and to enthusiastically get involved Greece Solidarity Campaign. The demo’s next week and we should all go! Excellent summary of the situation David. Of course the outcome of the negotiations between the Syriza led government and the Euro-area powers will have to be a compromise. Given the balance of forces what other outcome would be feasible? I agree with those who call for the maximum solidarity and support for Syriza’s demands across the European Union. The Greece Solidarity demonstration next week should just be a beginning. Most available evidence suggests that popular opinion across Europe is with the Greeks. Working with the Independent Greeks may not be Syriza’s biggest weakness, but giving the Ministry of Defence to ANEL so he can stir up tensions with Turkey is hardly ideal, while having a right winger in charge of the police will hardly help route out the fascists of Golden Dawn. Like you I can’t comment on the strike situation in Greece, but that Syriza have currently worked to demobilise the level of class struggle over the past couple of years in the run up to their electoral victory so that they can appear ‘respectable’ and ‘responsible’ seems to be indisputable. I hope they switch from this course and now they are in office declare that the police will not be used on any striking workers in future and that they would welcome workers’ striking and occupying their factories if they want to. However they will only do this if there is pressure from below on them – hence the importance of Antarsya’s orientation not on elections but on mobilising the working class for the battles ahead. Agree though that of course we should support the Greece Solidarity Campaign – and we should also build the anti-racist and anti-fascist demonstrations on March 21 which come out of a tradition which began in Greece – and will be taking place in cities across Europe including in Athens. As far as I can see, Syriza has a pretty decent record of supporting strikes – as good as any of the revolutionary parties in Britain or Greece. The significant deviation appears to be a single strike, in May 2013, when the teacher’s union called a strike in the middle of the exam period. The strike was then banned by the government. The teachers then found themselves isolated – with the KKE and the other unions opposing the strike (the KKE even calling on its school student members to cross any picket lines). At this point, one of two groups of Syriza teachers voted against the strike, hastening the calling-off of the strike. I appreciate that the SEK line (repeated in SW) is that this one decision definitively proves the treachery of Syriza not just in 2013 but for all time, but is there really no possibility that the teachers who voted that way thought a retreat was a tactical necessity based on the isolation of the union, and the actual balance of forces? Hasn’t it occurred to you that the argument “I trust SEK, they’re Greek, they must be right”, applies to the people they are critising too? Socialism from below does not mean insisting IWW-style that any compromises with managers are sell-outs – it means using struggle to get the best result available and being fearless about the range of tactics available. And. over time, drawing lessons from successful strikes and from other forms of workers’ struggle. Even just the five weeks of 2015 furnish at least one example of a local strike called off because the SWP members who led the strike reckoned that the result acheived for the workers, while objectively a defeat (the imposition on new staff of the worse contracts that the strike had been against), was better than anything further strikes would acheive. I haven’t criticised on this blog the people who made that call, my sense is that their assessment was the right one (although I might have less kind words for the apparatchiks who deemed it necessary to spin an honourable defeat as a victory). It is a fantasy (and not a very Marxist one) to assume than any party that ever brings a strike to an end without having achieved the unconditional surrender of the managers therefore proves itself to be corrupted for all time. Far left commentary about Greece falls into two opposing groups. Those, the majority, who after many years of defeat are desperate for good news who are exultant at the electoral victory of Syriza on the one hand. Albeit some are more critical and maintain more reservations than others. And on the other hand those who have made heroic efforts to get their denunciation of Syrizas coming treachery in as soon as is humanly possible. Dave’s piece has the merit of being honest in being forthright in its recognition that the party, the SEK, and the coalition, Antarsya, that its author has backed to date is small and lacking in influence with the government. His conclusion that it would have been better and would now be more sensible to support Syriza from within is not the only conclusion that revolutionaries might draw from the argument and facts he presents us with. Nor need the conclusion be drawn that the only possible solution is to back Antarsya and hope for a revolutionary overthrow. Despite many interesting articles being written about the recent elections I feel that certain facts have been under reported and if properly noted help to place events in better perspective. For example the voting turnout was only 63.87% which I’m guessing indicates that a large part of the population is not convinced by the arguments of right or left. This is suggestive that the active base of the left has not grown as substantially as its ability to win seats in the Greek parliament. What has happened is that those sections of the population politically committed have polarised and become more active. If this guess on my part is correct it follows that non-parliamentary groups might very well have more support within the social movements than their voting figures would suggest. However, to register a note of caution, it would seem that the Greek voting system is rather cumbersome and makes it difficult for many to actually cast a ballot. But again this would further place importance of the social movements and the activity of socialists within them. Another point I would like to make is that there will now be enormous illusions in the ability of Syriza to deliver at very least some redress after the swinging attacks of the last few years. Class politics have polarised in Greece in the last period but the locus for the working class to express its opposition to austerity has shifted back and forth from the electoral arena to the streets and back again to the electoral arena. That the recipient of working class votes has changed from the social democratic PASOK to the more properly considered reformists of Syriza is secondary. What is of far greater import is the partial retreat from the streets and strike action in order to return in a more radical guise to the electoral arena. This is a pattern that we in Britain are far from unfamiliar with and can draw conclusions from. It is correct then to argue, as Dave does in his piece, that if and when Syriza ‘betrays’ the working class a further extra-parliamentary radicalisation will not automatically take place with Antarsya the beneficiary. In any case the idea that Antarsya is a revolutionary organisation that could lead revolutionary struggles is far from certain if we remember that its largest component is a group deriving from the KKE one might add just as is the case with Syriza! Indeed it is no more likely that the larger and more rooted KKE will benefit from the defeat of the Syriza government and any subsequent radicalisation. It is far more likely that defeat will demoralise and further demobilise the working class. Although it would almost certainly be the case that sections of the social movements and of the unions, most probably those influenced by either Antarsya or the KKE, would become more combative. But to discuss matters simply as if the class struggle was an affair of rival parties presenting a passive working class with their respective programmes is to make a fundamental error. The revolution is not a party affair! The workers revolution and the defence even of a left government depends in the first instance on how class conscious the proletariat is and how organised it is. The latter being a function of the former. It is then idiocy simply to address revolutionary politics as if it is merely a matter of being more militant of demanding more as Dave rightly tells us. A revolutionary programme is something rather different from a mere shopping list of demands. Rather than simply making demands a revolutionary organisation must show the way forward and the next steps required at any given point. It is far from clear to me from reading the available commentaries that any force in Greece is doing this whether from within or from outside Syriza. Finally is it more advisable for revolutionaries to situate themselves within Syriza or outside? Clearly this is not a question of principle and all the revolutionary groups in Greece today work within one or other coalition anyway. The real question is how best can revolutionaries speak with and build roots in the working class? It seems the case to me that this goal will not be automatically furthered by becoming a part of Syriza and by accepting the discipline of that party. We know in any case that Syriza is not a party well rooted in the working class and lacks a developed apparatus of branches to which workers relate. It might then be the case that whatever they write in their theoretical journals those groups that are part of Syriza could be stymied in their efforts to win over workers simply by being part of a party that lacks working class roots. To conclude I feel that revolutionaries in this country are ill advised if they believe that by sympathising with either those forces within or without Syriza, the DEA or SEK respectively, that they will better be able to help or more cynically win undeserved glory. Rather revolutionaries here should seek to find ways to given practical assistance to all workers in struggle in Greece and we should not place wagers on this group or that. Indeed we would do well to remember that the revolutionary left in Greece is divided into several different competing organisations often on the basis of historically irrelevant differences (in this respect it is positive to note the recent fusion between the DEA and Kokkino) that mean nothing to militants. For my part then I shall place a little wager on the working class and hope that the revolutionary forces in Greece can in time unite because a revolutionary does not yet exist in that country and is desperately needed. “Where this justification of Antarsya begins to fall down is with the assumption that the best alternative to a programme of reform is to offer a rival, programme of greater reforms. In this revolutionaries are different from reformists principally in that they ask for more. So Syriza offered Greek nationality to the children of all migrants; and, like a poker player, Antarsya “raised” them, by offering to legalise all immigrants in Greece. Syriza said that it would stop all the planned privatisations; Antarsya’s reply was to say that it would undo every privatisation in Greek history. How does this analysis hold up in light of current events? Pretty poorly I summarize. Syriza’s leadership has given away much on the memorandum – and their platform from 2012 to government to the current crisis has moved steadily rightward. Their illusions on staying in the euro and stopping austerity have not helped. But the Greek working class has been steadily tiring of the game troika. The left: Syriza, Antarsya, even KKE members and independents have come together on the NO campaign and NO to blackmail. And that is a wonderful thing. Syriza’s leadership wants a no but only to strengthen their bargaining position (they have capitulated on most demands except debt restructuring and have already signalled they will pretty much roll over on all other outstanding demands). But since you seem more concerned with purging your old politics – the problem with ex-smokers clubs – than with having a thoughtful analysis of the situation I doubt the facts on the ground will change your mind (I am not an SWP or IST member). Too bad. I think Antarsya has played a valuable roll in the NO campaign on the left since Syriza was elected. As a revolutionary communist I’m not impressed by the actions or tactics of Syriza a not terribly left reformist party with roots in Stalinism. I’m deeply impressed however by the fact that, as a result of its connections with the masses, its leadership have at last thrown down the gauntlet to the Troika and said thus far but no further. Despite their vacillations and compromises in this manner they have tried as best they can to serve the interests of the masses and the nation as best they can. For reformists they’ve performed magnificently and it would be sensible for those of us who hold revolutionary positions, but do not live in Greece, to remember that the revolutionary forces in that country could not have gained leadership of a large section of the Greek working class, as has Syriza, because the masses do not yet understand that the road towards reform is closed. And only when the masses understand that the reformist road is closed will they turn towards our comrades in decisive numbers. In Greece the battle is not even between the abstract question of reform or revolution but to what degree must austerity take place. The masses have not yet realised that only by fighting for real reforms, that is for those demands that all revolutionary forces in Greece raise in or out of Syriza, can austerity be defeated. Only once the Greek nation has reached that point of ideological development of class consciousness will it be possible for revolutionaries to counterpose our aims and methods to those of the reformists. Its worth remembering then that the primary duty of revolutionaries in Greece at the moment is to make contact with the masses that currently support Syriza and, to a lesser degree, the KKE. This, of course, means the United Front and whether that tactic is applied from within or from outside Syriza is a small matter that should be of n concern to revolutionaries in this country. As I said earlier on Dave’s blog the wager revolutionaries place is on the working class not on this party or that. In any case there is, as yet, no revolutionary party in Greece only sects. What we must hope for from todays vote is a massive vote for the OXI position and the creation of improved conditions for the defence of our class and the development of a revolutionary current. There is nothing to be gained, unless one wishes to bask in reflected glory, by taking sides between Antarsya and Syriza or the SEK and DEA. Frankly its sectish and slightly creepy. Must not this analysis be revisited and questioned? The key strategic question of an orientation to the euro was rightly forefronted by the KKE and Antarsya -albeit in different ways. I think those questions have really borne themselves out in the logic of the situation. And if Syriza passes this deal, what does this say about the Left Platforms strategic approach? It is good people on the ground in Greece are coming to those conclusions and the situation has forced people to tactically work together (the no vote), the call for the general strike. But this above analysis cannot simply stand in light of current events. “The Left platform doesn’t necessarily have tons of independent muscle as of yet”, agreed, although I’m told that (eg) the recent strike vote came from Syriza dissidents. Maybe part of the point is that the Yes/No split in Syriza hasn’t solidified at the divide between the Left Platform and everyone else, but somewhere to the right of there. (Just looking at the Syriza MPs who voted No, only about half of them were LP). So there might be a little more social weight there than you might think. I don’t have a lot of knives out for Antarsya really – it was more the Antarsyists outside Greece who were the focus of the original piece. I’m not persuaded that the latter understand what’s going on now any better than they did. As for Antarsya itself, I found this article useful (https://www.jacobinmag.com/2015/04/antarsya-syriza-communist-party-greece-euro/) and then I did spend a few weeks after my own piece trying to follow Antarsya’s website with the assistance of google translate and didn’t find it compelling at all (this isn’t the fairest way to try and follow a social movement: the DEA website is relatively dull, while Rproject who DEA are close to is much more lively). Anyway, irrespective of my lack of google discoveries, I bet Antarsya’s activists have been playing a proud role locally (that I take for granted, the Jacobin piece confirms it). As for “What matters now is fighting unity of those that oppose austerity”: yes, totally. Very clearly the combinations of forces that we’ve seen in the last 6 months won’t be there, in the same combinations, in 12 months time.